Marvel's big gamble continues to deliver. Guardians of the Galaxy moved back into the #1 spot at the U.S. box office this weekend, having finished the last two weekends in second place to Teenage Mutant Ninja Turtles. 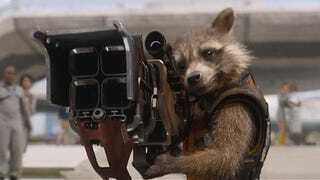 Guardians of the Galaxy pulled in an estimated $17.6-million this weekend (to TMNT's $16.8-million), bringing its total U.S. gross to an estimated $251.88-million. In doing so, GotG has become the highest grossing summer movie of 2014, and the third-highest grossing film of the year; still in its sights are The Lego Movie (currently in the #2 position for 2014, with a total gross of $257.75-million) and frontrunner Captain America: The Winter Soldier (which closed this weekend at $259.77-million).